Hugo Alfvén is one of Sweden´s most performed composers. Although his works clearly derive from the national-romantic era, most of them have never lost their popularity. Moreover, Alfvén composed what have become repertory works in different genres. Alfvén started as a violinist, but soon developed his musical interest into both composing and conducting. Beside a successful career as composer, he was very much appreciated as both orchestral and choral conductor. For many years he conducted the famous male choir Orphei Drängar, also writing several compositions for this ensemble. 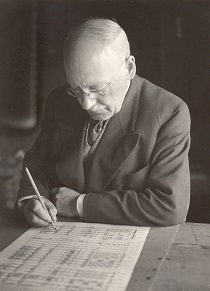 Alfvén wrote his key works for orchestra rather early in his career, continued later to compose mostly for choir (both male and mixed choir) and for voice and piano.